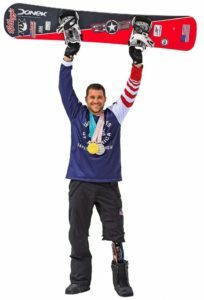 “Monster” Mike Schultz is a 2018 Winter Paralympic Gold and Silver medalist and inventor, and most recently, a 2018 ESPY Award winner. In December 2008, Mike suffered an accident during a professional snowmobile competition that ultimately led to the amputation of his leg above the knee. As he worked to get back into competition, he was disappointed to realize that his new prosthetic leg wasn’t up to the challenge. “I realized, ‘I need to design my own prosthetic so I can get back on my snowmobiles and dirt bikes,” Mike says. He went into his shop, and a few months later Schultz was again competing on the national stage with a mechanical knee of his own design at the ESPN Summer X Games (where he received a silver medal on his dirt bike). Realizing the need for advances in high impact adaptive sports prosthetics, he founded BioDapt, Inc in July 2010, making the Moto Knee available to active amputees across north America. He added the Versa Foot to the BioDapt collection in 2013; it was named one of the Top 10 Inventions of 2013 by Popular Science magazine. Currently more than 100 wounded soldiers, amputees, and extreme athletes (including his competitors) are using Mike’s prosthetics. At TEDxEdina 2018, who knows how we will be inspired to improve our lives, our community and ultimately our world? Learn more at www.tedxedina.com, where you can check out our complete speaker lineup. Purchase your tickets here. ← Ideas, connections, and curiosity. It’s TEDxEdina 2018.